We love wooden toys. They last much longer and are sustainably sourced. Hape’s kitchen and food range are designed to be cherished and to last a lifetime. 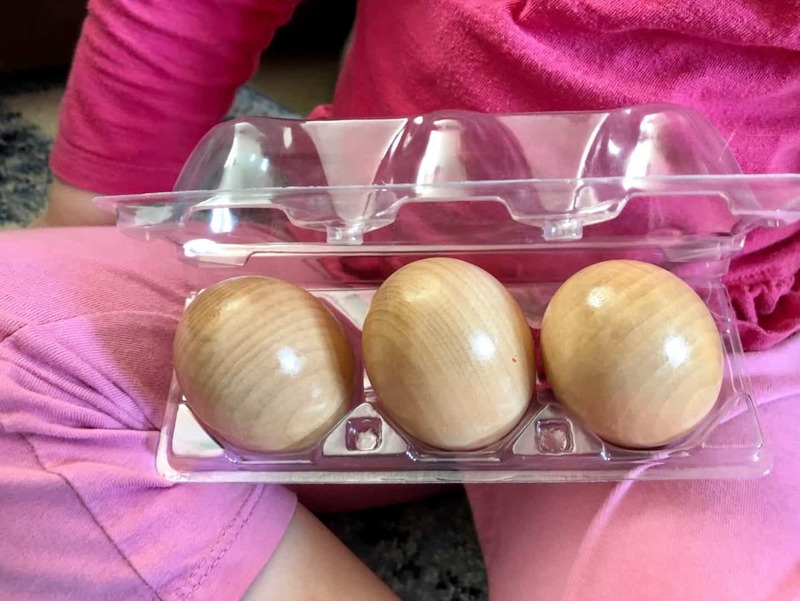 Luckily we were gifted a few of the wooden toys from their range to see what we thought. Designed for ages 1-3+ I’ve had both the girls playing with the new wooden creative toys as soon as they arrived. Included in Hape’s Kitchen and Food range are kitchen appliances like a blender, toaster, coffee and waffle machine. 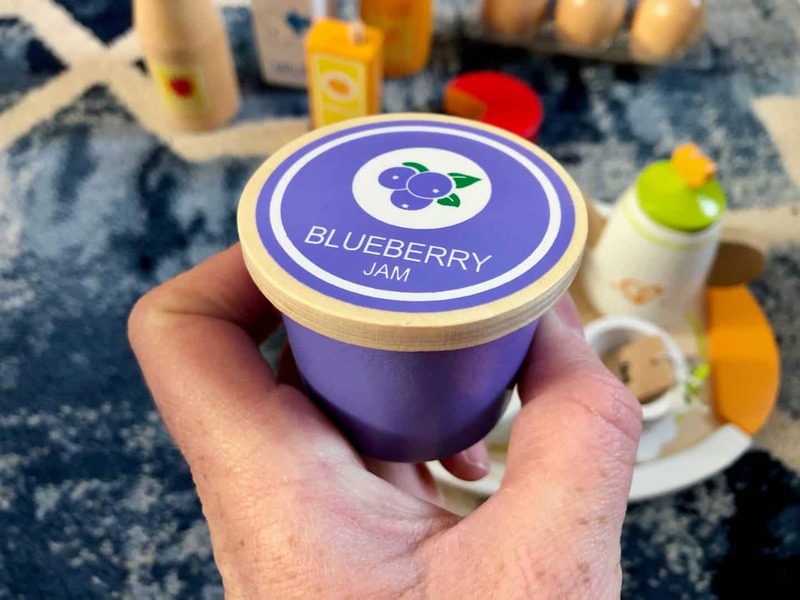 As well as traditional wooden toys for girls and boys like fruit and vegetables, and their modern day equivalent – healthy basic foods and drinks. 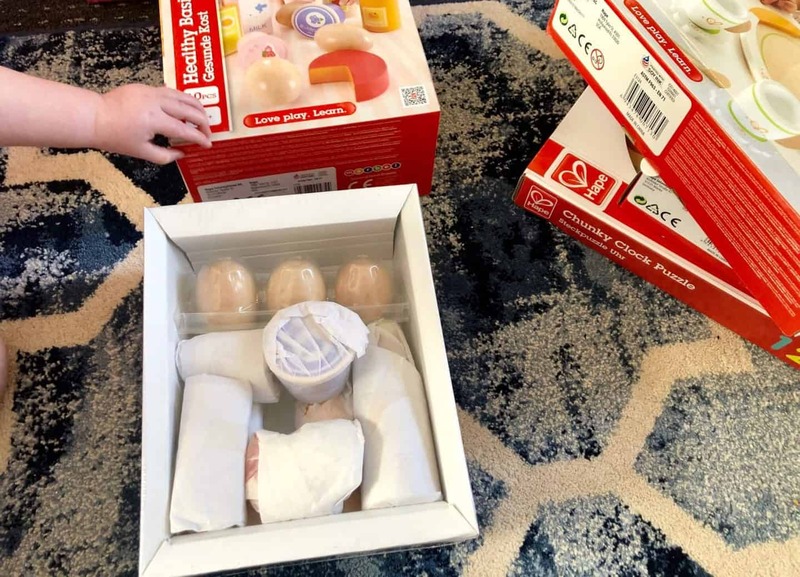 So starting off our review we unboxed the Healthy Basics set. I was eager to see what they had included in this. 1x milk carton, 1x apple juice, 1x orange juice, 1x strawberry yoghurt, 3x eggs, 1x blueberry jam, 1x block of cheese. Children can learn just what goes into making healthy food choices, with this wooden playset. The pieces are chunky, well made and painted with water-based paint. 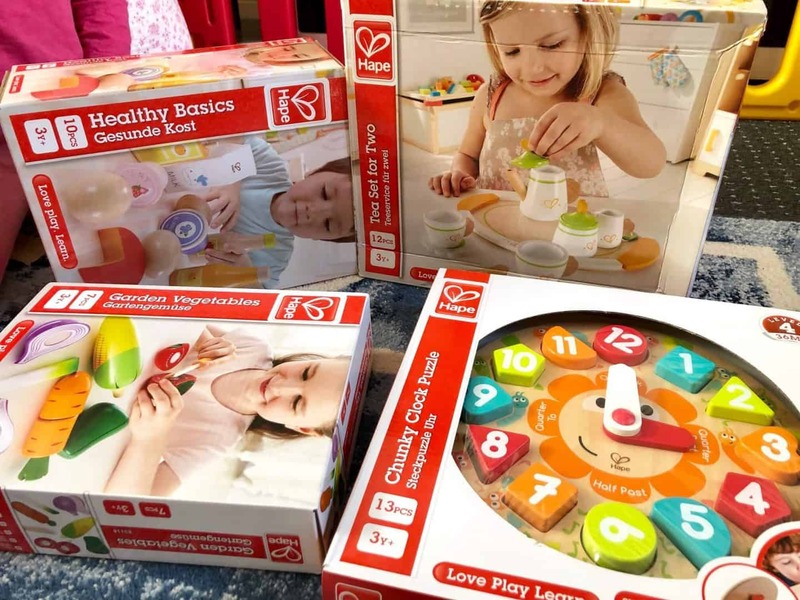 Good quality wooden toys made to last. My only concern was the wooden straw on the orange carton wasn’t fixed and easily came out, could potentially be a choking hazard. Pretend play just hit a new high. 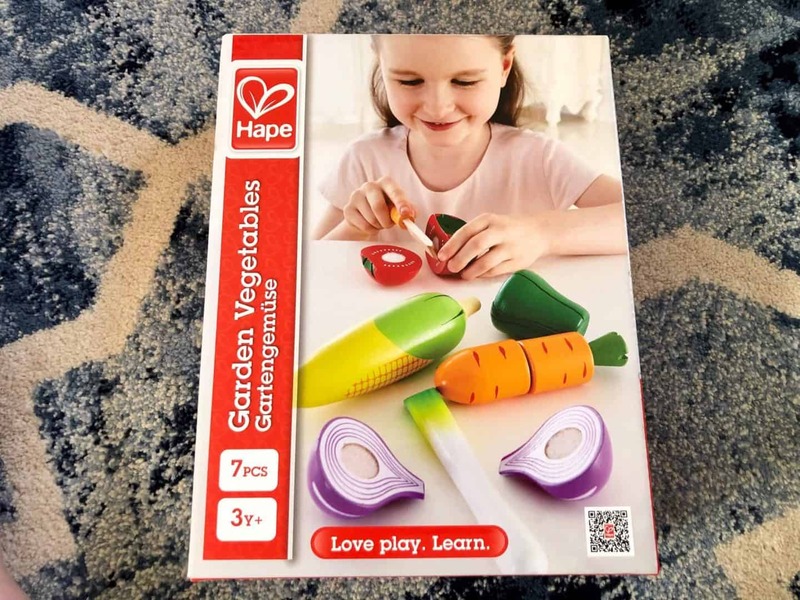 With this wooden garden vegetable set you have your own knife to chop your vegetable. Great for learning about the 5 a day and healthy eating habits. The pieces are brightly coloured. The ones that can be cut into half are stuck using velcro. A simple but effective way. The corn and leek are whole pieces. I love that this set stimulates little ones imagination. My daughter has been setting up her own cafe with them. You can check out our YouTube unboxing video further down to see this set in action! 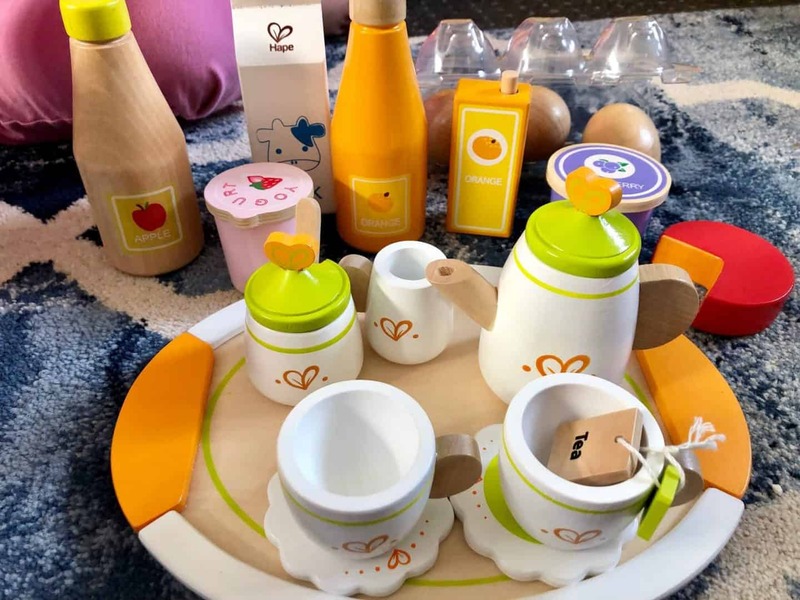 Most young kids love role playing and making a cup of tea is always popular. My elder daughter is now forever making cups of tea for everyone! I love the cute wooden teabag, it’s the ideal touch. Toys like this help out loads with hand eye coordination and imagination. 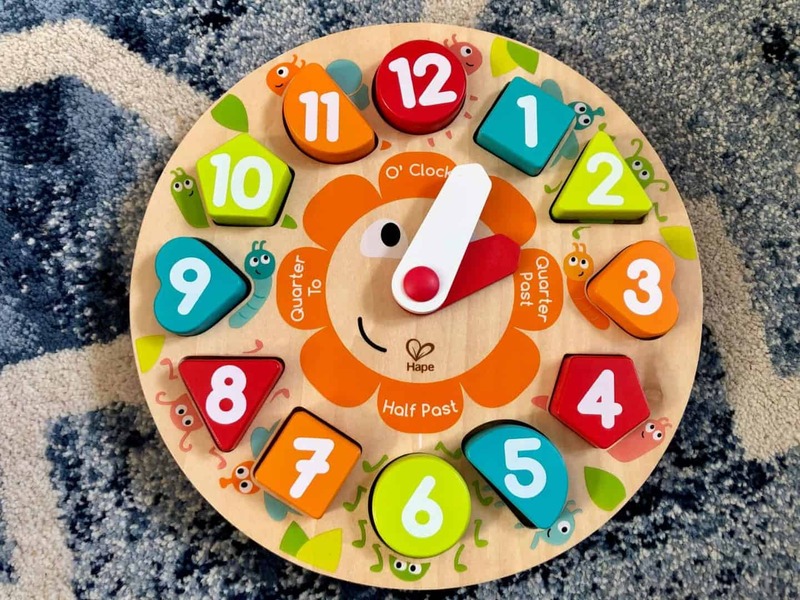 As well as the kitchen wooden toys, Hape has a wonderful selection of wood puzzles, like this chunky clock shape sorter puzzle. 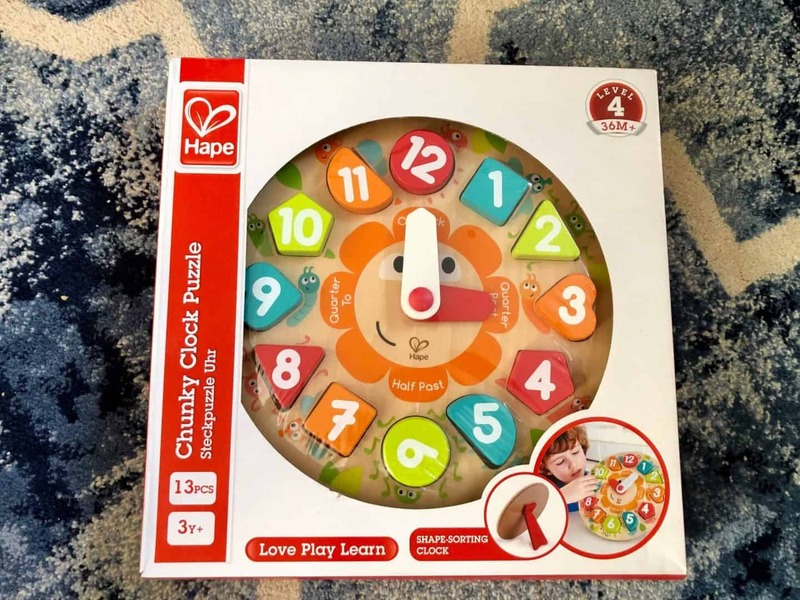 My 3 year old knows all her numbers and shapes, and is now interested in clocks. So I’ve been explaining to her about time. She also loves her puzzles! It has a great little stand on the back you just clip on. You can fill in the puzzle pieces to complete the bugs all the way around the clock. 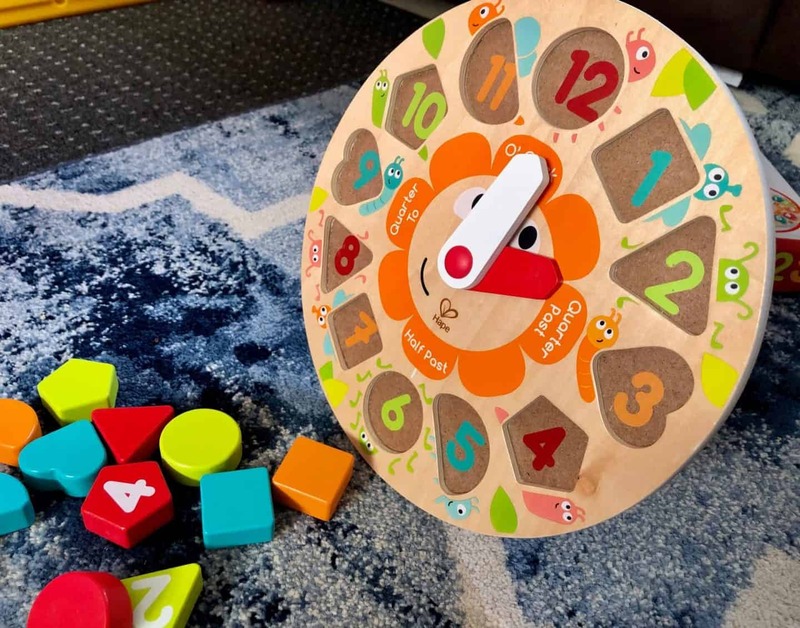 It helps develop dexterity and hand-eye coordination. 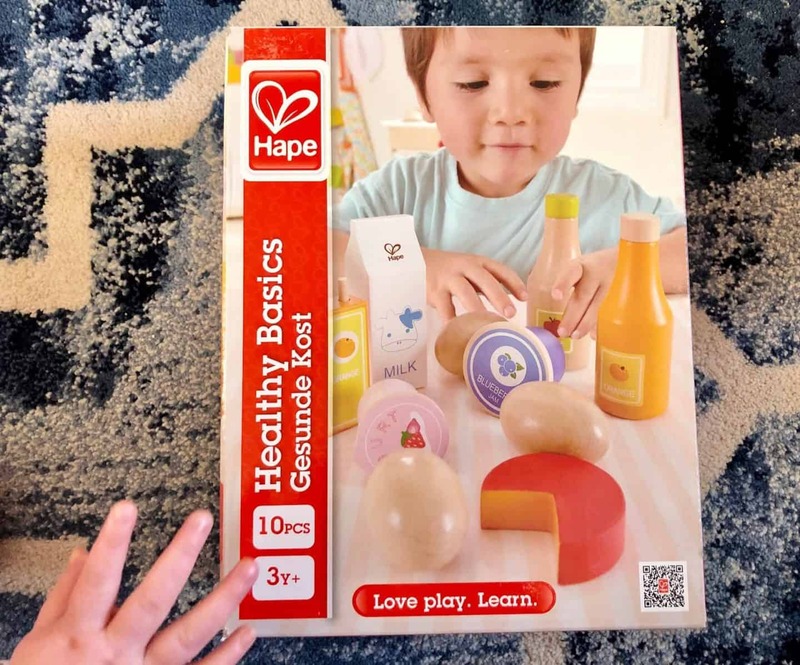 Thanks for stopping by today, I hope you have enjoyed this review of Hape’s wooden toys, they are truly brilliant! You can catch our other toy reviews here. Some great well made toys there, I love wooden toys they really do last.